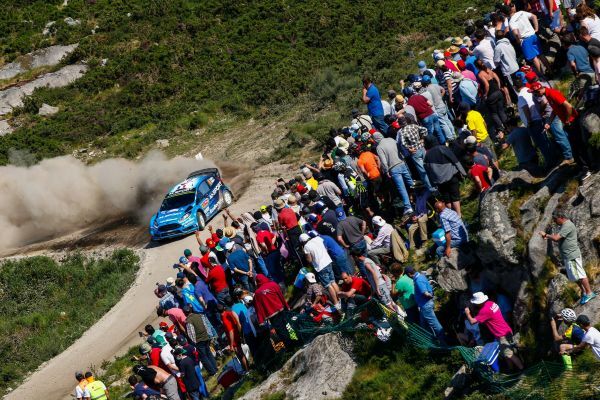 M-Sport World Rally Team’s Éric Camilli delivered a breakthrough performance during the fifth round of the FIA World Rally Championship – piloting his Ecoboost-powered Ford Fiesta RS WRC to a career-best fifth place. Co-driven by fellow Frenchman Benjamin Veillas, the pairing were tasked with producing an increase of speed whilst maintaining the consistency delivered in Argentina – and they did so brilliantly. Upping his pace significantly, Camilli secured the third fastest time through the first pass of Baião (SS10) – 4.5 seconds faster than World Champion Sebastien Ogier and just 0.7 seconds adrift of second-placed man Andreas Mikkelsen. Continuing a string of competitive times the rookie – who was contesting only the 10th gravel rally of his career this weekend – quickly climbed into a strong fifth place which he maintained with a near-flawless performance. Learning rally by rally, M-Sport’s latest protégé has delivered a glimpse of his potential and is only expected to improve as his confidence, knowledge and understanding continues to grow. In the sister M-Sport Fiesta RS WRC, seventh place was enough to see Mads Østberg retain third place in the drivers’ standings – proof of what has been a highly consistent start to the season. Partnered by fellow countryman Ola Fløene, the Norwegian was pleased with his driving but continued to struggle for confidence when down shifting through the loose gravel. Benefitting from a much better road position through today’s final stages, the grip levels increased, Østberg’s confidence increased and his times got much closer to what is expected of him and the Fiesta RS WRC. Elsewhere, in the WRC 2 category, Elfyn Evans missed out on what could have been another victory behind the wheel of the Ford Fiesta R5 Evo. Experiencing a technical problem which sapped the Fiesta’s performance through Friday’s stages, his rivals were given a rare opportunity to pull ahead. Regaining full power on Saturday, the Welshman made quick work of reeling in first-placed man Pontus Tidemand – taking 7.2 seconds out of the Swede on SS11 alone. Unfortunately, the charge was not to last and the team were denied another almighty comeback. Clipping a tree stump 11.3 kilometres into SS12, he rolled his Fiesta and was forced to accept Rally 2 regulations for the event’s final four stages. Missing out on valuable points, Evans and co-driver Craig Parry will be sure to return with a point to prove at Rally Poland. “It’s been a great weekend and a real confidence boost. We set some good times and had a really good feeling with the car all weekend. “We’ve taken a big step in so many areas. We’ve learnt how to better set-up the car, how to tackle the ruts on the second pass and we’ve also been making a lot of improvements to our pacenotes over the last couple of rallies. “To be honest, I didn’t expect the improvement to be so big so fast. That was a really nice surprise but we have been working really hard so it’s good to see. “It’s been quite enjoyable today. The better start position has helped a lot and we’ve been able to get a lot closer to where we should be. “There have obviously been a lot of snags this weekend – the most costly one coming from myself – so it’s not what we wanted. We can’t turn the clock back, but we know that we had the pace to win this rally. “It’s great to see Éric performing so strongly – especially when you consider the start to the season he has had and how much pressure he has been under. He’s shown the potential that we felt he had when we took him on board and his performance this weekend has brought a real enthusiasm back to the team. ”Mads has had some issues, but he produced a solid drive today and has maintained his third place in the drivers’ standings which proves what a consistent start to the season he has had. “In the WRC 2 category, we had something of a missed opportunity. Even with his problems on Friday, Elfyn and the Fiesta had the speed to win but an unfortunate pacenote error halted their charge.